Burden of chronic disease throughout the world is steadily increasing. Cardiovascular disease (CVD) and chronic kidney disease (CKD) frequently coexist and represent a major challenge in today's medicine. 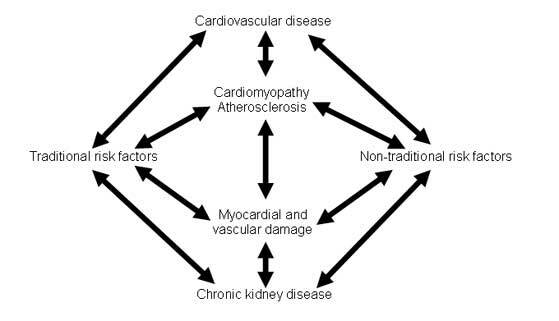 Although exact pathophysiological mechanisms are not fully understood, it seems that CVD and CKD can initiate, enhance, and perpetuate each other, eventually leading to vicious circle and premature death. Current evidence suggests there may be additional non-conventional risk factors for CVD. The evidence for prognostic management is less robust than in patients with preserved or mildly impaired renal function. Prevalence of CVD, including stroke, peripheral vascular disease, sudden death, coronary artery disease, and congestive heart failure is about twice of that observed in general population and is increased over the entire span of CKD. In addition, the onset of CVD frequently is premature when compare to general population. The Cardiovascular Health Study analysis demonstrated that per every 10 mL/min per 1.73 m2 decrease in glomerular filtration rate (GFR) the risk of CVD and all-cause mortality increased by 5% and 6%, respectively. Similar observations for decrease in renal function were reported in general population and in patients suffering from myocardial infarction, enrolled to VALIANT trial. Indeed, in end-stage renal failure, the CVD is by far leading cause of morbidity and mortality, causing 40-50% of hospitalizations and deaths. This is likely due to a combination of factors, including high prevalence, an increased risk for adverse outcomes after coronary revascularisation or valve interventions, and under use of established primary and secondary prevention strategies. Patients with CKD may present with CVD limited to heart or to vessels. Myocardial damage has clinical correlates in left ventricular hypertrophy and/or dilatation, which are associated with systolic and diastolic dysfunction. Right ventricle is affected in advanced stages of the disease. Arterial remodelling due to atherosclerosis or structural changes in arterial wall may be independent from myocardial damage. However, and since patophysiological processes are interrelated, most of patients have complex CVD. It is therefore not surprising that patients with CKD are entering the cardiovascular continuum early. When arterial hypertension and atherosclerosis develop, they pick up the pace in patients with CKD and lead to development of ischemic heart disease, degenerative valve disease, and chronic heart failure. Traditional risk factors for development of CVD include hypertension, diabetes, dyslipidemia, smoking, increased body mass index, older age, male gender, physical inactivity, stress, and positive family history. As CVD in patients with CKD occurs frequently and prematurely, it seems plausible that other risk factors are involved in the pathogenesis (Figure 10.1.). Some of those are specific to CKD and include haemodynamic overload, anaemia, chronic inflammation, oxidative stress, hypercatabolic state, uremia, calcium-phosphate imbalance, hyperhomocysteinaemia, endothelial dysfunction, increased sympathetic activity, insulin resistance, thrombogenic disorders, and metabolic syndrome. Both traditionaland non-traditional factors promote cardiomyopathy, aterosclerosis, and/or arteriosclerosis. In patients treated with dialysis, fluctuations in blood pressure, electrolytes, and cardiac filling can further aggravate the condition. From clinical perspective, it is important that risk factors can be identified and monitored by means of biomarkers. Whilst some are biomarkers per se (e.g. cholesterol), other risk factors are reflected by measurable biomarkers. Widely available and established laboratory biomarkers are lipids, blood glucose and glycated haemoglobin, haemoglobin, and C-reactive protein which are mainstay of regular patient follow-up. With identification of novel risk markers, battery is expanding to chronic (sub-clinical) inflammation, endothelial dysfunction, oxidative stress, and vascular ossification. Each of these is not only highly prevalent in CKD but also more strongly linked to CVD than in the general population. However, a causal relationship remains to be established. The biomarkers like IL-6, TNF-α, and asymmetric dimethly-arginine are therefore not ready for prime time and clinical use. Whilst needed evidence is pending, it may be worthwhile to consider experience from other chronic disease and to test whether it is applicable to patients with CKD. Insulin resistance, catecholamine, uric acid, albumin, TSH, natriuretic peptides, matrix metaloproteinases, high sensitivity troponin, testosterone are associated with poor outcome in patients with chronic heart failure. If those associations could be replicated in patients with CKD, we would be able to better stratify their risk and to adjust the pharmacological management accordingly. Figure 10.1. Relationship between cardiovascular disease, chronic kidney disease, and risk factors. There is robust evidence for beneficial effects of renin-angiotensin-aldosterone system inhibitors, hypolipemic drugs, and beta-blockers in patients with CVD and normal renal function. However, patients with advanced CKD were usually excluded from randomized trials and only limited data is available on this topic. Most evidence comes from observational studies, subgroup and post hoc analyses of earlier trials. The benefit observed has to be interpreted cautiously in order to avoid early enthusiasm. To date, the randomized, placebo-controlled trials have been disappointing and unable to show a survival benefit of various treatment strategies, including lipid-lowering, increased dialysis dose and normalization of haemoglobin. The contradictory findings in CKD compared with the general population are not completely understood but may be attributed to different risk factor profile (see above). Indeed, seemingly paradoxical associations between traditional risk factors and cardiovascular outcome in patients with advanced CKD have complicated our efforts to identify the real cardiovascular culprits. Findings are further diluted by reverse epidemiology, which be discussed below. Renin-angiotensin-aldosterone system inhibitors, hypolipemic drugs, and beta-blockers are associated with a variety of side effects and some of those are more frequent in patients with CKD. Hyperkalaemia is main concern for treatment with aldosterone antagonists, angiotensin converting enzyme inhibitors and angiotensin receptor blockers. In patients with chronic heart failure, the use of aldosterone antagonists in patients with GFR < 60ml/min should be cautious and in patients with GFR < 30ml/min those agents should generally be withheld. Hypolipemic drugs may also cause concern of side effects in patients with CKD stage 3-5. Clinicians have to be familiar with their pharmacokinetic properties as renal excretion of statins varies from < 2% in atorvastatin to 20% in pravastatin. Fibrates can increase serum creatinien concentrations which had led to recommendations for cautious use of fibrates in patients with CKD. Combination of different drugs increases propensity of side effects which poses an important limitation to use in clinical practice. With increased risk profile associated with several drugs, the lack of mortality benefit may be due to side effects rather than to lack of clinical efficacy. Same concern may cause lower use of specific treatment in patients with coexisting CKD and CVD. When evidence-based cardiovascular therapies are used in patients with CKD, their clinical effect is not as big as in patients with preserved renal function. A recent study in 7884 patients (1766 had CKD with GFR < 60ml/min) showed that targets for blood pressure and glycosilated haemoglobin were achieved in 39% and 44% of patients with CKD, which was significantly lower than in patients without CKD (65% and 53%, respectively). In a variety of chronic disease, including CKD, the so called "reverse epidemiology" is described. Conventional risk factors for CVD such as obesity, increased body fat, and cholesterol are paradoxically associated with lower long term mortality. Whether this applies to all CKD patients or only to those with chronic cardiac condition currently remains unknown. The reverse epidemiology could contribute to inconclusive findings of specific treatments in patients with CKD. Patients with lower BMI, fat tissue content, and cholesterol have increased activation of inflammatory system and more pronounced metabolic disturbances. It is therefore very likely that therapeutic targets differ over span of chronic disease and that all patients do not benefit from same treatment. Menon V, Gul A, Sarnak MJ. Cardiovascular risk factors in chronic kidney disease. Kidney Int 2005;68:1413-8. McCullough PA, Li S, Jurkovitz CT, et al.Chronic kidney disease, prevalence of premature cardiovascular disease, and relationship to short-term mortality. Am Heart J 2008;156:277-83. Stenvinkel P, Carrero JJ, Axelsson J, Lindholm B, Heimbürger O, Massy Z. Emerging biomarkers for evaluating cardiovascular risk in the chronic kidney disease patient: how do new pieces fit into the uremic puzzle? Clin J Am Soc Nephrol 2008;3:505-21. Baber U, Toto RD, de Lemos JA. Statins and cardiovascular risk reduction in patients with chronic kidney disease and end-stage renal failure. Am Heart J 2007;153:471-7. Balamuthusamy S, Srinivasan L, Verma M, et al. Renin angiotensin system blockade and cardiovascular outcomes in patients with chronic kidney disease and proteinuria: a meta-analysis. Am Heart J 2008;155:791-805. Lahoz C, Mostaza JM, Mantilla MT, et al. Achievement of Therapeutic goals and utilization of Evidence-based cardiovascular therapies in coronary heart disease patients with chronic kidney disease. Am J Cardiol 2008;101:1098-102.